For Canada users, click Lists, Insurance Carriers. Carriers are automatically populated and easily maintained. Insurance carriers marked as CDANet are capable of sending electronic claims to ITRANS or TELUS. To search the Carrier list, use the Carrier field to search by name, or Phone field to search by phone number. To only view CDANet carriers, check the box for CDAnet Only. To update your Carriers list, select your criteria and click Update Carriers. This button is for ITRANS 2.0 and Claimstream users only. Phone: Update carrier phone numbers. Add Missing: Add any missing CDANet carriers. 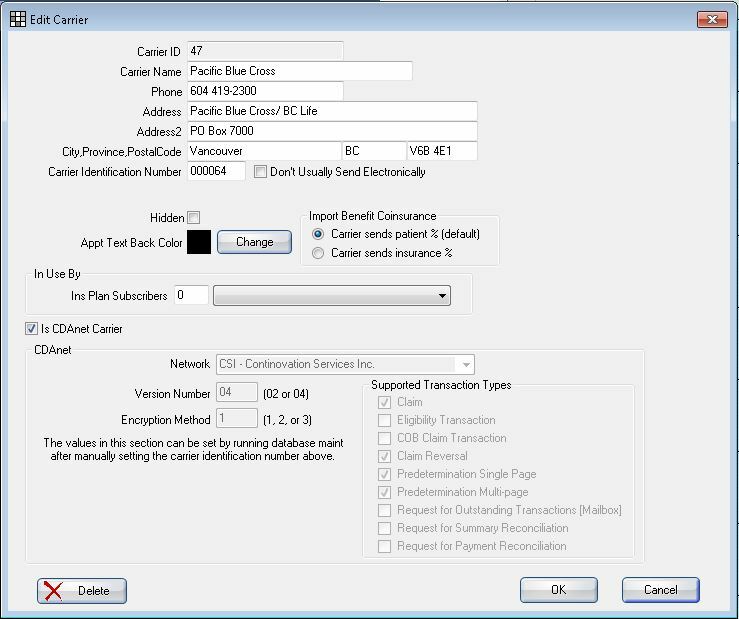 Regular ITRANS users can update carrier information by running the Old tab in Database Maintenance. Double-click on a carrier to view carrier information and CDANet information. The Carrier information in the top half is editable. See the Carriers List for more information. The data in the lower half of the window is not editable by users but is instead maintained by the CDA. This information is updated when running the Update Carriers tool or database maintenance as noted above.